Learn the principles behind object-oriented programming and within a few chapters create a fully functional Ruby application. You'll also gain a basic understanding of many ancillary technologies such as databases, XML, web frameworks, and networking - some of which are needed as part of a fully functioning Ruby application. Based on the bestselling first and second editions, Beginning Ruby, 3rd Edition is a leading guide to learn Ruby from the ground up. 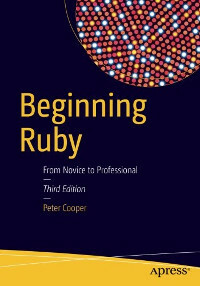 The new edition of this book provides the same excellent introduction to Ruby as the previous editions plus updates for the newest version of Ruby 2.3 which includes new garbage collection support of symbol type objections, a new incremental garbage collector, memory management, vfork(2) with system and spawn functions and much more. This book can also be used as a textbook or companion to a textbook on beginning Ruby programming. The light and agile Ruby programming language remains a very popular open source scripting option for developers building today's web and even some enterprise applications. And, now, Ruby also has applications using the Raspberry Pi, popular among hobbyists and makers. Many former Java developers still use Ruby on Rails today, the most popular framework for building Ruby applications.